Never lose anything with a storage box or smoking supplies pouch Kavatza. Whether it is long rolling paper, tips, lighters or grinders, everything can be stored in a smoking supplies pouch or storage box. Furthermore, these products help you with easily rolling your joint. It is made of durable and natural materials, and perfectly suited for festivals, weekends off or vacations! Of course, an experienced smoker or joint smoker has many supplies for rolling a joint, at any time. 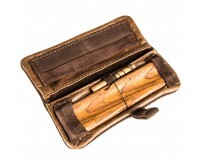 With a smoking supplies pouch you can store all your products in a safe place. A storage place for all your smoking supplies is of course way more convenient than having all those products in your pocket or scattered throughout the house. Especially during holiday, festival or weekend away, a tobacco pouch comes in handy. All products in this category are from Kavatza. Kavatza is a Greek word. It means 'your own secret storage space'. Kavatza is market leader in premium storage products for smoking supplies. The storage products from Kavatza are very authentic and of high quality, thanks to the use of durable and natural materials such as wood and leather. For storing smoking supplies, Dutch-Headshop not only has luxury smoking supplies pouches available, but also storage boxes. Besides storing smoking supplies, both products have another function. Both the storage boxes and the tobacco pouches can be useful for rolling a joint. All Kavatza products are equipped with a wooden board for easy filling your joint with smoking contents. All Joint Roll Boxes are made of nicely finished wood, and are therefore extra robust in use. The boxes provide enough space for all your smoking supplies. The Joint Rollers Pouches are made of high-quality material as well. 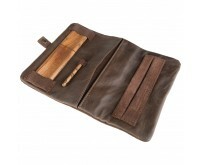 The inside of the Joint Rollers Pouches are made of leather, and the outside of suede. 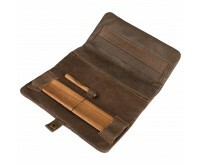 The pouches have a luxurious look and provide great support for rolling a joint, apart from the storage space. For true lovers of hashish or cannabis, a tobacco pouch or storage box shouldn't be missing in your inventory. Which product suits you? Order it quickly and discreetly at the Dutch-Headshop!